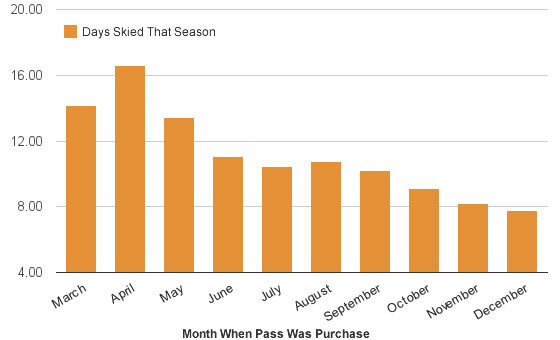 So, two weeks ago I shared some data on how likely skiers are to renew their passes based on when they buy them. 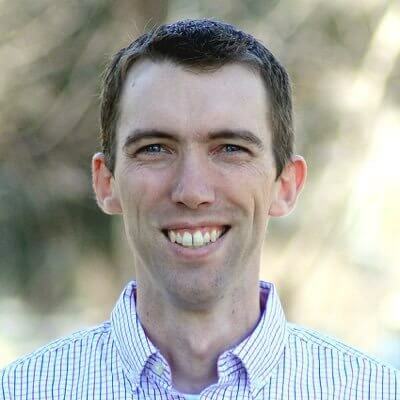 Turns out, the guys and gals who snag their pass in the spring are much more likely to renew than those who buy in fall. True to my word, I did test it in this week’s Stash post. 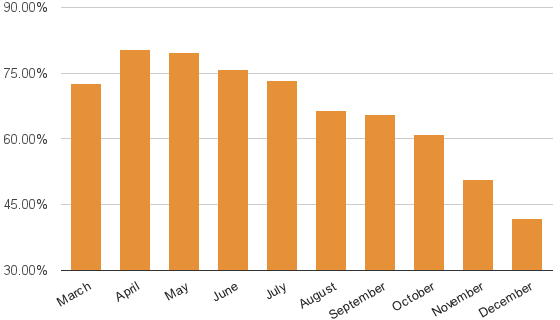 Here’s what the chart looks like with the month the pass was purchased on the X-axis and the average days spent on the mountain by each group on the y-axis. The short story is this: skiers who buy their passes early are the ones who will be skiing more during the upcoming season. They seem to be more dedicated to skiing and more sure of where they’ll be the following season. There is little doubt in their mind they’ll be in the same place next year ready to ski just as many days as the last season. In the ongoing search for loyalty, that not a bad trait to stick next to the folks in your database, eh?